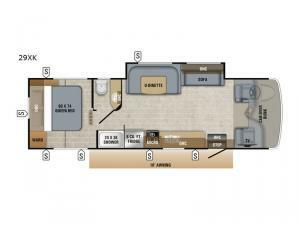 Start thinking about all the places you will visit while driving down the road in this Redhawk class C gas motorhome. 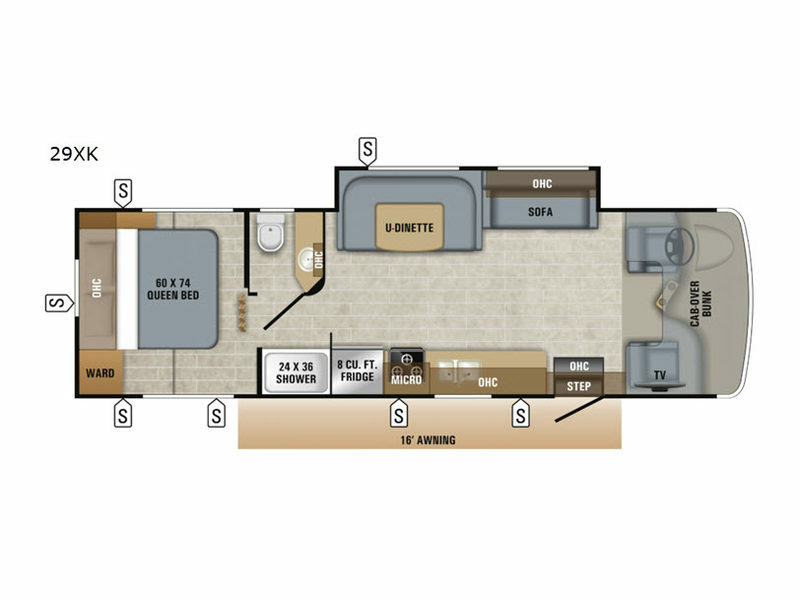 Model 29XK allows you to travel and sleep in comfort as well as dine and get cleaned up in your own RV. You will find storage for a weekend or week-long trip, a TV over the cab, and a semi-private rear bedroom when you close the privacy curtains. When it's time to retire for the evening, the walk-around queen bed provides you with a good night's rest no matter where you go. You also have a full split bath which includes a private toilet and a sink room. You can either cook meals or heat up take-out in the large kitchen, the choice is yours. You will even find a place for your golf clubs or camp chairs in one of the exterior pass-through storage compartments. It's time to stop thinking and start planning your next trip in a Redhawk on the open road.